At the beginning of the year, 14 states raised their minimum wages, lifting wages for over 4.6 million workers in states across the country. Unlike last year’s increases, the majority of these increases (12) were scheduled increases initiated by legislation or approved by voters through ballot measures. The other two (Colorado and South Dakota) were changed as a result of inflation indexing—a process adopted by 15 states by which the minimum wage is automatically adjusted each year to match increases in prices. Table 1 below shows the magnitude of the minimum wage increase in each state, ranging from an increase of 5 cents in South Dakota to 1 dollar in four states (Alaska, California, Massachusetts, and Nebraska). 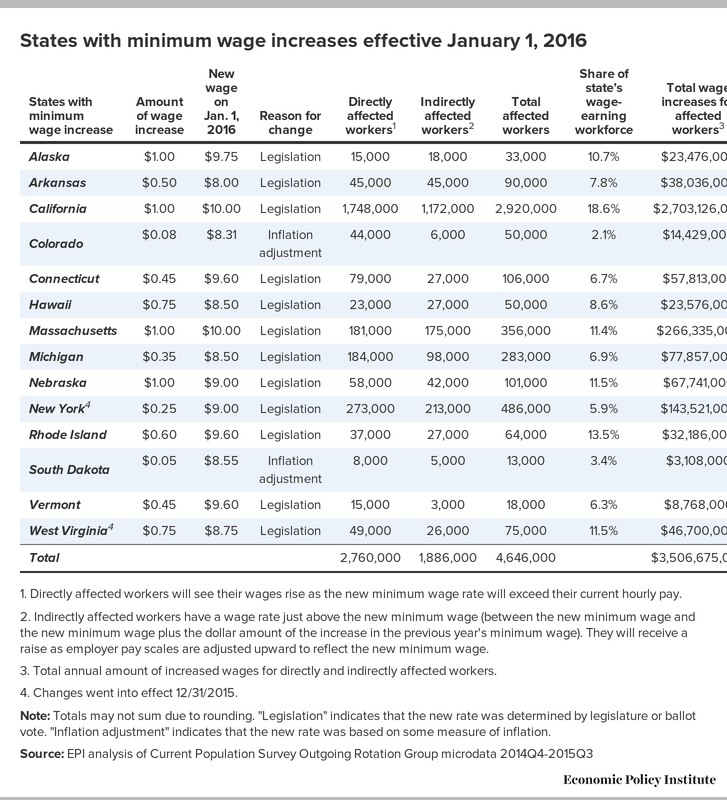 Because inflation was very low in 2015, nine of the 11 states with inflation indexing set to go into effect at the beginning of the year did not adjust their minimum wages in 2016. Colorado and South Dakota were the only exceptions, yet their increases were small, and thus the increases affected relatively small shares of each state’s workforce: 2.1 percent and 3.4 percent, respectively. Minimum wage increases affected a much larger portion of the workforce in states that initiated larger increases through legislation. For example, California’s $1.00 minimum wage increase lifted wages for 18.6 percent of the state workforce. All together, these increases will provide 4.6 million workers over $3.5 billion in higher annual wages. This additional pay, though modest, represents a significant boost to the spending power of low-wage workers and their families. For example, a worker in Nebraska who was previously earning the state minimum wage of $8.00 an hour in 2015 will see their hourly pay increase by 12.5 percent. 1. Directly affected workers will see their wages rise as the new minimum wage rate will exceed their current hourly pay. 2. Indirectly affected workers have a wage rate just above the new minimum wage (between the new minimum wage and the new minimum wage plus the dollar amount of the increase in the previous year's minimum wage). They will receive a raise as employer pay scales are adjusted upward to reflect the new minimum wage. 3. Total annual amount of increased wages for directly and indirectly affected workers. 4. Changes went into effect 12/31/2015. Note: Totals may not sum due to rounding. "Legislation" indicates that the new rate was determined by legislature or ballot vote. "Inflation adjustment" indicates that the new rate was based on some measure of inflation. A number of other states and localities will increase their minimum wages later in 2016. To see the most up-to-date list of states’ minimum wages and those with upcoming increases later in the year, refer to EPI’s Minimum Wage Tracker. It also provides information on localities that have initiated their own local minimum wages. In addition to the 14 states from Table 1, seven sub-state localities also increased their minimum wages at the beginning of 2016. Five were in California (Mountain View, Oakland, Palo Alto, Richmond, and Santa Clara) and the other two were Portland, Maine, and Seattle, Washington. The largest increase took place in Portland, Maine, where the minimum wage was increased by $2.60 to $10.10 an hour. The federal minimum wage has lost nearly a quarter of its inflation-adjusted value since the late 1960s, making it harder for workers in the lowest-paid jobs to make ends meet and forcing many—including those who work full time—to rely on federal safety net programs to support themselves or their families. Given that the country has become vastly richer and more productive over the past 47 years, there’s no reason why workers in any state should be getting paid less today than their counterparts a generation ago. The good news is that states aren’t waiting for the federal government to act. The success of campaigns to raise the minimum wage at the state and local level speaks to how broadly voters and policymakers throughout the country recognize that the federal minimum wage of $7.25 is too low. Over the past year, more states and localities raised their wage floors in the absence of a federal increase than ever before. Nevertheless, many other states still have minimum wages at or below the federal minimum, and states with minimum wages that are not indexed for inflation will see the value of their minimum wages erode in the coming years. We need a national wage floor that ensures a decent level of pay for work regardless of what state one lives in. That’s why Congress should follow the example set by voters and legislators in these states and raise and index the federal minimum wage—fixing this problem once and for all.